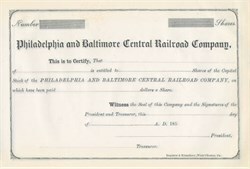 Beautifully engraved unissued certificate from the Philadelphia and Baltimore Central Railroad Company dated 185_. This historic document has an ornate border around it and is over 140 years old. Before the Civil War in 1860 a census was taken in Cecil County. This census gives a good overview of the businesses, farms, population, wealth and products of this time period in Cecil County. In the years directly preceding the American Civil War almost 142,000 acres of Cecil County's more than 225,000 acres were listed as improved acres used in farming. The total value of these farming acres was listed as $8,168,950, which was the highest worth of acreage on the Eastern Shore. (At this time, the farm acreage in Kent County, a smaller county than Cecil County, was valued at $6,877,930.) In addition, Cecil County led the Eastern Shore counties in the numbers of horses, milk cows and other cattle. (Oxen were not included in these estimates.) Cecil County was also first in oats, potatoes, barley, buckwheat, pounds of butter and cheese, hay, clover seed, grass seed, hops, gallons of sorghum and molasses and was second in wheat, orchard products and in the value of its animals slaughtered. It was third in rye and corn and fourth in wool. In 1860 the population of Cecil County was about 20,000 with 2,918 free blacks and 950 slaves. Only 849 men and 109 women of this total population were employed in industry. In industry at this time, employees earned $264,981 annually and produced $1,655,595 worth of products from a total industrial expenditure of $895,200. At this same time, Cecil County farms including acres, livestock, commodities, implements and machinery, were worth $8,456,938 or about ten times as much as Cecil County industry was worth. In 1860, there were 190 industries in Cecil County. Each of these industries employed from one to 134 employees. These industries included thirty six flour and meal mills, twenty six blacksmiths, twenty three saw mills, seven manufacturers of farm implements and seventeen boot and shoemakers. Cecil County had two mines, four brick kilns, one clothing manufacturer, five herring fisheries, two cabinetmakers, eight iron works and two printers. The county also had two stone quarries, five tin, copper and iron sheet makers and fifteen wagon makers. Two of Cecil County's largest employers were the iron works and the cotton goods mills. The county also had a chrome mine and a sash, door and blind company. During and after the Civil War some of these once prosperous Cecil County industries began to decline. The reasons for this decline are several. First, the basic culture in Cecil County was rural and agricultural; so much of the emphasis and interest of the leaders in the community was placed upon farming rather than upon industry and business. Secondly, the psychology of the County, especially after the Civil War was a feeling of mobility and movement, a thrust towards expansion and a searching for opportunities in other places. If a business failed in the County, people involved with the business were often inclined to move and travel to other places, such as the western areas of the country. Those who remained in the County were often those individuals who were deeply rooted residents, usually those individuals who owned property or land. One of the biggest blows to Cecil County's economy after the Civil War was the failure of the iron industry. This industry failed primarily because of the discovery of higher quality iron ores in the west. These western iron ores were far superior to Cecil County's siderite shale iron. Also, after the Civil War the volume of traffic on the Susquehanna and Chesapeake and Delaware Canals began declining. This reduction in traffic on these canals occurred even as the function of their locks improved and transportation through them became faster and more dependable. The Chesapeake and Delaware Canal was nationalized finally in 1929 and made into a much more efficient sea level canal. Nevertheless, traffic along this canal remained steady or in some instances lessened. In the years following the Civil War Port Deposit, Chesapeake City, Slide # 107 Frenchtown, and Elkton gradually became less bustling as they slowly lost their positions as stopping and starting places. This occurred because rail transportation became more efficient and more rapid, and was re-routed. It also occurred because more goods began to be transported by the more efficient and faster railroad systems, rather than by the slower and therefore more expensive ship, coach, canal or road transportation systems. Baltimore became the stopping and starting point for these reoional railroad systems and the city benefited as a result. By 1888, Cecil County's population had beeun also to decline. During this period the population dropped from 27,108 in 1880 to 23,612 in 1920. However, from 1920 to 1940 the population began to slowly increase to 26,407. However, the period of the 1860's to the 1920's was not a period of complete decline. Cecil County also experienced many new innovations andinitiatives during these years. In 1860 the Philadelphia and Baltimore Central Railroad (known locally as the Baltimore Central) opened a new rail line that went through Rising Sun. This was an extremely exciting development at the time for this small community. Also, in 1908 a Cecil County Governor of Maryland, Austin L. Crothers established the State Roads Commission and initiated Maryland's first State Roads System. In 1905 the mileage of Maryland State Roads totaled approximately 220 miles and cost about $665,000 or an average of $3,000 per mile. In order to supply the public with the cars that they now needed to drive on Maryland's new roads Duyckinck Sterrett and Co. established Cecil County's first car dealership in Rising Sun in 1909. This car dealership sold Hupmobiles, Invincible Schachts and Oakland machines. It was located in the Rising Sun depot warehouse which adjoined the Philadelphia, Baltimore, Central Railroad Station. In 1913 Warren Boulden Sr. unloaded the first freight car full of model T's at the depot on Railroad Avenue in Elkton. Warren and his mechanic, Archie Bryant assembled these Model T's in Boulden's Elkton garage and then paraded them down Main Street on a Saturday to the marching strains of the Elkton Cornet Band. In 1876 Day Basket Factory was established in North East. Slide # 111 Also near North East at Hances Points, Bay Boat Works was established in 1928. This company serviced and sold boats and related marine hardware. These two businesses typify the character of industries which arose in Cecil County during the 1860's to the 1920's. These businesses were established by resourceful Cecil County residents who capitalized on the special resources and natural attributes of their county. The Day Basket Factory built a successful business on the utilization and revitalization of centuries old basket makino, techniques which had been originated by the native American peoples who had prospered in this region years before any Europeans even set foot on this continent. Bay Boat Works capitalized on the rich resource of the county's waterways, its fishing and boating to create a prosperous business. The period after the American Civil War was a period of limited decline in the industry and in the population of Cecil County. However, these years following the war were also years of innovation and initiative in the county. The residents of Cecil County who were more rooted to this land fostered their reliance on Cecil County's rich, fertile and productive farmland. These resourceful residents also fostered the birth of new industries and businesses which capitalized upon Cecil County's natural gifts and special attributes. Even as some individuals left the county to seek opportunities in other places, such as the west, others saw opportunities here in the county and stayed to take advantage of them. The years after the American Civil War were years of transition and transformation in Cecil County, as well as in the growing and changing nation. What really changed the face of Oxford, Pennsylvania in the late 1800�s was the railroad. The town�s population grew from 186 to more than 1000 between 1850 and 1870. The Dickeys, one of the town�s oldest and most influential families, were responsible for bringing the railroad through Oxford, Ringler said. The Baltimore-Ohio-Pennsylvania Railroad brought industry to Oxford, and the town blossomed. Investors from Delaware, Chester, and Cecil counties founded the Philadelphia and Baltimore Central Railroad in 1854. Where the tracks cross Hodgson St., a roundhouse and machine shop existed. The freight station was also in this area. There were several other sets of railroad tracks going through town. The Dickeys took a lot of chances and risks and some of them ended up losing money. There is now one property in town, a farm on Rt. 10, still owned by the Dickeys, and one Dickey descendent teaches at Lincoln University. Recently, Dickeys from Germany, Texas, and all over the country gathered in Oxford to have a wedding at the farm. Oxford Grain and hay, built in 1868 and known then as S.R. Dickey and Co., is the oldest Oxford business still in existence. It sits along the tracks of the old Philadelphia-Baltimore Central railroad tracks behind Fourth and Market Streets. This 130 year old business is now owned by the Drennen family, who have kept the historical integrity of the building.